As I’m sitting in my dining room writing this and scheduling out my days for the week, I’ve remembered that my ladies egg production has dropped. If you’re new to raising chickens, this could be something frustrating or even scary! I can’t tell you how to keep it from being frustrating, but it doesn’t have to be scary. There are reasons why your 12 hen flock might go from producing 12 eggs a day to maybe 2 or 3. As the days get shorter, so might your egg production, at least temporarily. Many people, especially in the North, use artificial light to aid in a smooth transition. We have a fluorescent light in our hen house but I rarely turn it on unless I need to go in at night. I’m assuming it’s because I live in Florida so shorter days don’t exactly mean cooler days, which will also affect the number of eggs you pick up. It gets hot, hot, hot here. Nobody told me that extreme heat would affect egg production. I quickly found out that it would and what to do. If you live in an area that heats up to extreme temperatures in the summer, make sure your flock has shade. On our homestead, I was noticing the chickens would never leave the hen house when it was hot! Providing shade can be as simple as stringing up a few tarps over some grassy patches of land. For example, this year my 20 hen laying flock went from giving me 15-18 eggs a day to 4 if I was lucky. Once August hit, it all the sudden became so terribly hot in the daytime, not that June and July were a breeze but it wasn’t as extreme. We’re now starting October and the egg production is creeping back up there. It’s starting to cool down which is great for us, but not as great for others. As it is with hot weather, the opposite is also the same. Extreme cold weather, or even just a slight change in the weather, will affect egg production. It’s October in Florida and the weather is starting to “cool down”. In the mornings, if I get up early enough, I actually require a light sweater to do the chores! My hens have dropped in production because of this change, but they’re slowing getting back to normal. If you live north of the snow line and your winters are white, you can use heat lamps to provide some extra “warmth” through the change and through the winter. Another option, also a cheaper and more beneficial option, is to practice the “Deep Litter Method”. The Deep Litter Method is, without going too far into it, a way to naturally warm your coop in the winter and produce a wonderful compost for your Spring garden! You can read a great guest article by Liz of The Cape Coop on Pampered Chicken Mama’s site HERE. Liz explains all the great benefits of the Deep Litter Method! Following up on the cold weather affecting your egg production, you’ll need to be prepared for your chickens to molt. This means your chickens will shed their feathers in order to grow new ones and prepare for the winter. It’s like how does grow their “winter coat”, but in a chicken. This usually happens in late summer or the Fall before it gets too cold. Since it stays rather warm here year round, our chickens do not molt as intense as others might. It isn’t much you can do to speed this process up or down. Molting is a part of a chicken’s natural cycle and something you’ll just have to be patient about. Changing your feed can also affect your ladies egg production. Recently, I sent my husband to the feed store to pick up a few bags and he chose a different brand than I usually use. I couldn’t figure it out, but between it cooling down a bit here and feed my flock a different type of pellet, it makes complete sense why their egg production dropped so drastically. I will note that with anything when it comes to, well, everything, everyone’s experience will be slightly different. Some people will tell you that changing the feed all of the sudden will not affect the egg production at all. In the end, it really depends on your flock. These are only 4 reasons why your production might be affected. Really, there are many reasons why your ladies aren’t dropping the goods anymore. If none of these reasons above apply to your situation, be sure to check that your flock hasn’t fallen victim to internal/external parasites or other sicknesses. Once you’ve checked that your flock is healthy, and you don’t have any broody hens (read my Raising Chicks for Beginners instructional! ), you might want to make sure they aren’t eating those delicious farm-to-table eggs for themselves! Sometimes hens will eat their own eggs if they aren’t being fed enough or getting enough calcium. I’ll make this game even more fun and tell you that if you’ll rule out all of the above, then maybe something else is stealing eggs. Rodents and snakes are among the two most common eggs thieves! 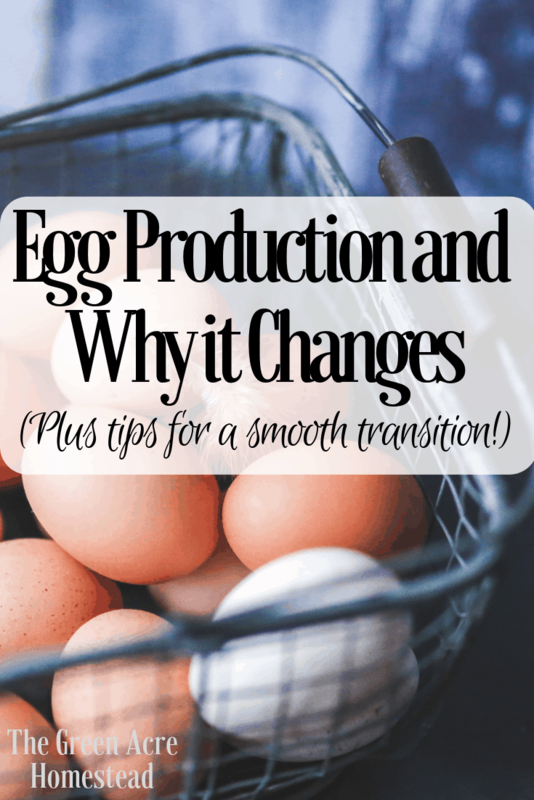 Has your egg production dropped? What other reasons do you know about that will affect it? I’d love to learn from you and chat! This is the first year I’ve had a significant egg drop with the weather change, and I’ve only increased their space! LOL But yes, I agree that switching the feed is probably the largest reason for the change. I was just telling someone how each flock is so different and it’s sometimes so hard to “pinpoint” the reasons for things. We’ll all just keep chugging along and doing our best. Thanks for stopping by, Cherelle!